This event is held during the perfect planting season for those starting or supplementing a California native garden. There will be California native plants of just about every description from grasses to trees and shrubs, perennials to annuals, and even some succulents and ferns. California native plants are optimal for saving water; attracting native birds, bees and butterflies; and preserving San Diego’s natural heritage. In addition to plants, there will be seeds, books, posters and other plant-related items. Friendly knowledgeable experts will be on hand for plant selection advice. Cash, checks and credit cards are accepted. A convenient curbside loading zone is available for picking up plants. 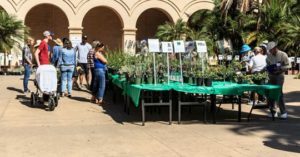 This California native plant sale will be in the Balboa Park’s Theater Courtyard between the Casa Del Prado Theater and Casa Del Prado and across from the West entrance of the San Diego Natural History Museum. 1600 Village Place in Balboa Park. For more information and to pre-order plants, click here.